There’s nothing worse than discovering that your car pumps in fake or weirdly amplified noise. Sure, I know isolation from other road sounds is a luxury, but it just sounds completely fake. Unfortunately, many electric cars have picked up this baton of sadness and ran with it, as Jaguar’s new I-Pace makes some of the worst fake car sounds I’ve ever heard—and it won’t be the last one to lie to you like this. 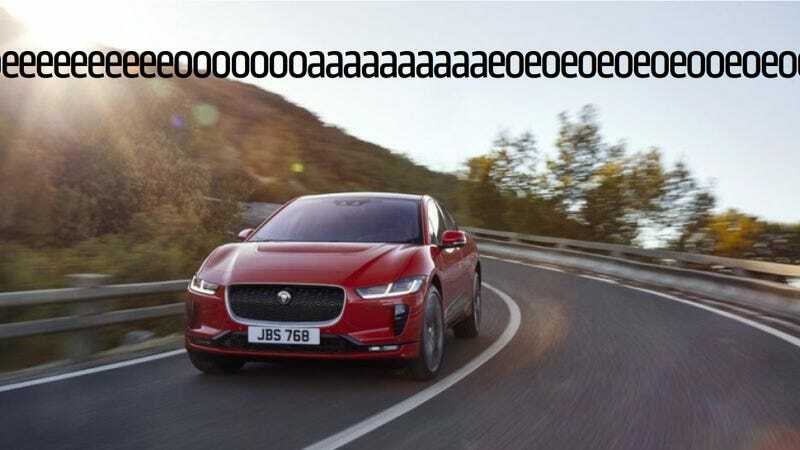 Electric cars don’t produce a lot of noise, so Jaguar made their in-car “exhaust note” sound like Dumb and Dumber’s most annoying sound in the world as heard through a toilet. Above is a clip of the sound the I-Pace makes inside when you give it the beans, as taken by Roadshow’s Tim Stevens. Jaguar calls it “Dynamic Audio,” which really just means that the pitch and volume of the droning changes with throttle position. Honestly, it sounds like Jaguar wanted to license The Jetsons’ flying car noises, but couldn’t, so they put Jim Carrey through a sound board instead. Hear the resemblance? It’s bad, and not to mention a new level in fakery. At least BMW’s dirty cheatin’ speakers sound like the car should have if BMW hadn’t muffled the engine with turbos, excessive sound deadening and a wanton disregard for aural pleasure. Their “enhanced” audio is still a slimy act of deception, but the I-Pace is a new low. That I-Pace noise is just fantasy. Irritating, droning fantasy. [Porsche head of electric vehicle development Stefan] Weckbach, who earlier this decade prepared the 718 Boxster and Cayman to transition to turbocharged four-cylinder engines, explained that Porsche will tune that sound in the production car by filtering out some of the high frequencies—the whine—through the strategic use of shielding. At the same time, engineers will make it more robust by aiming to let the lower-frequency and mid-frequency sound through. In the Cross Turismo concept, the net effect is that you hear more of the low whir and howl of the motors than you would since electric-vehicle motors went brushless. If you close your eyes, it’s not far from the sound of cooling fans in old Porsche flat-sixes. You can make it sound like an old flat-six cooling fan all you want to—it still isn’t one. That’s a dirty, rotten lie. Look, cars. All I ask is that you be honest with me. Making noise on the outside to warn pedestrians that there’s a car seems like a noble pursuit. Pumping fake, tweaked or otherwise “enhanced” sounds into the cockpit is just a dirty, rotten trick and I won’t stand for it. These new fast luxury electrics are exciting cars! They don’t need weird fake sounds inside to convince me of their worth. UPDATE [6/15]: Fortunately for those of you who like your cars to sound like cars even if that car is kind of quiet, Jaguar’s in-cabin noise can be turned up, down or off, per their PR director. Stevens also uploaded a clip of the noise in action, in case you’re curious there.